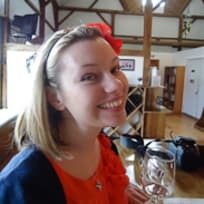 Jennie is known for whipping up indulgent desserts and healthy treats on her flour-dusted home on the Interwebs, One Sweet Mess. Her signature style of baking involves making a mess in the kitchen. 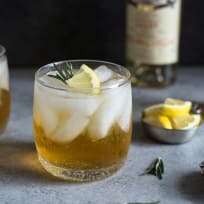 This Lillet spritzer with honey and rosemary is a sophisticated summer cocktail. 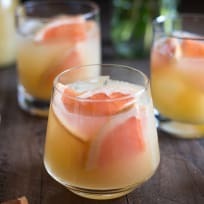 Make a whole batch for your next party. 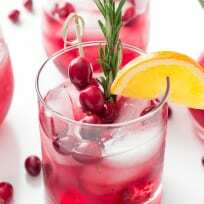 This Cranberry Orange Bourbon Smash is a refreshing combination of oaky bourbon, tart cranberries, and sweet orange juice. 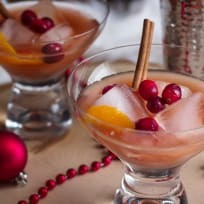 A hint of rosemary infuses this cocktail with the flavors of winter. These Fudge-Stuffed Chocolate Chip Cupcakes are far from average. This moist, tender cupcake gets studded with mini chocolate chips and stuffed with homemade hot fudge. To raise the bar a tad, they get frosted with a silky smooth malted milk buttercream frosting. Cherry chocolate chip muffins make a wondrous brunch or breakfast treat. These summer-inspired muffins are loaded with ripe cherries and sweet chocolate chips. They bake up tender and moist with a crunchy toasted almond crust. These double chocolate Almond Joy cookies are double the chocolate-y goodness with an added bonus of toasted almonds and shredded coconut. These giant cookies are supremely moist. Toasted coconut ice cream loaded with almonds and dark chocolate. Doesn't that sound like just about the best thing ever? Brown butter brownies with chai are rich and delectable, with high notes provided by spicy tea. Just try and resist 'em. We dare ya. These rocky road brownies are fudgy, extra chocolate-y, and dripping with gooey toasted marshmallows. You won't be able to resist eating more than one!